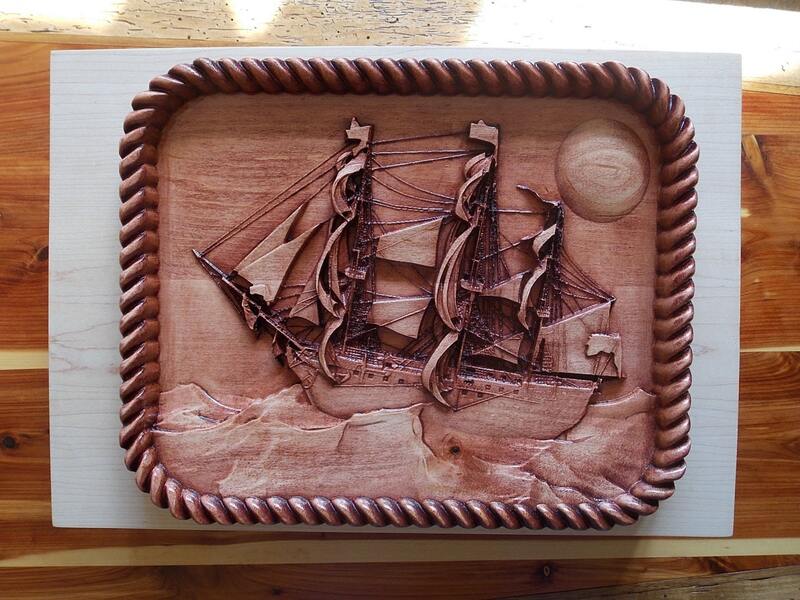 NAUTICAL DECOR WOOD CARVING: This vintage Victory Ocean Sail Ship is an unique nautical wall art decor wall hanging carved from solid maple wood stained with dark mahogany creating a stunning piece of Nautical Wood Wall Art perfect for the vintage ship collector or enthusiast. The detail in this wood carving is breathtaking beginning with the rope frame to the intricate parts of ship itself. As you look at this carving, you can feel the ship moving through the ocean. This is a MADE TO ORDER wood carving. WOOD WALL ART: We specialize in transportation custom wood carving. Custom wood carving orders allow you the freedom to pick your wood species, stain preference, size and budget from the drop-down boxes to the left of the listing photo. The last photo is a chart to help you with the stain color on the different types of wood as a guideline. 3. Pick stain preference from last photo in listing type in message "box to seller"
4. Pick finish preference (unfinished, satin, semi gloss or gloss polyurethane finish" and type it into the message "box to seller."